Boston Teachers Union president Jessica Tang spoke at a rally outside School Department headquarters on Wednesday. 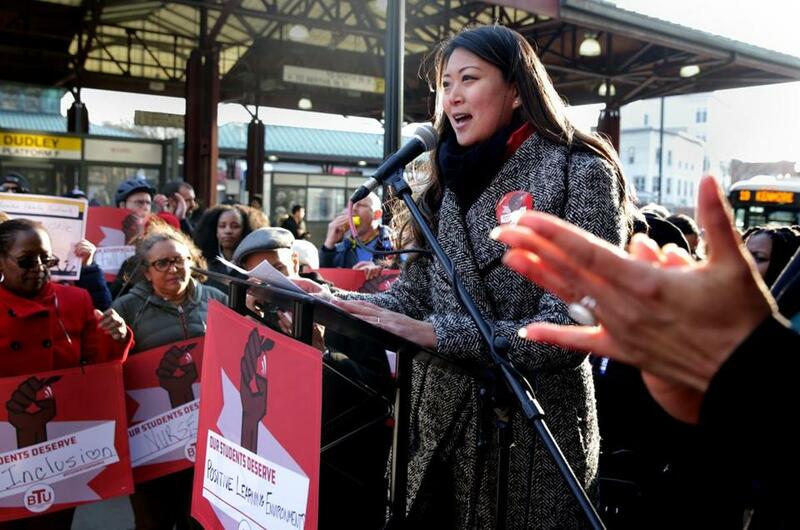 “We are fighting for special education done right,’’ union president Jessica Tang told cheering supporters in Dudley Square.“As educators we know that ...every student who walk through our door is precious. ...We show up and we will fight for what is right’’ for them. Tang, who said the union and city have been in negotiations for nearly a year, implored supporters to press their legislators for more state funding for Boston schools. While they agree that action is needed, they are working on getting “on the same page on best possible solution for students,’’ Tang said in an interview. Just after the rally ended, interim Superintendent Laura Perille announced the city will add more than $3 million in additional funds to support the schools during the fiscal year that starts July 1. Perille said in a statement that the district is always looking to expand supports for school communities through thoughtful investments that will most effectively serve the needs of students. She also said the school district is committed to reaching an agreement with the union on a contract that “ . . . reflects our values of having the best educators in every classroom, maintains our fiscal sustainability, and above all, puts the educational outcomes of our students first,’’ Perille said. 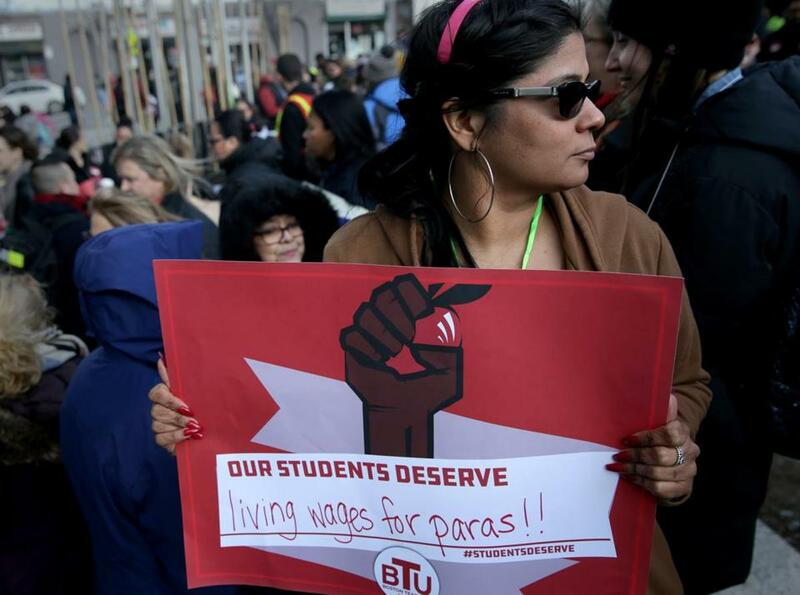 Boston school teacher Michelle Estrada held a sign at the Boston Teachers Union rally on Wednesday. The union, which has more than 10,000 teachers, school nurses, counselors, psychologists and other professionals — has been without a contract since August. At the rally, loud speakers blared Dolly Parton’s working-woman’s song “9 to 5.” A majority of the teachers in the district are women. Teachers said they need more help to teach immigrant students who are new to America, and more support to boost students’ mental health. Peng Zhuo, a teacher specializing in English is a Second Language at Madison Park Vocational Technical High School, decried the disparities she sees in city schools compared to more affluent schools in the suburbs. “We really need a lot more ‘wraparound services’ than we are currently providing,’’ especially in special education and ESL learners. Claudia Martinez, a guidance counselor at Boston Latin Academy, said a full-time counselor in every school means that students would be able to have much more help emotionally. “Our students face so much trauma … it’s really the counselors who try to get them to a better place so they can continue learning,’’ she said. PK Egersheim, a music teacher at the J. W. Hennigan K-8 school, said there is just one nurse serving the building that houses both the Hennigan and the Early Learning Center-West. And, he said, she only works the hours the Hennigan is open. The district, which has more than 55,000 students, has 131 school nurses this academic year, up from about 121 the previous year, Boston public schools officials said. District officials said the student-to-nurse ratio is 1-to-440 students, well below the 1-to-750 ratio established by the National Association of School Nurses. All of the city’s schools have at least one half-time nurse, with larger schools having more than one nurse and smaller schools having a nurse staffed at least half-time, the district said. Last year, Mayor Martin J. Walsh and his administration awarded an additional $2.4 million in the fiscal 2019 school budget for nurses, resulting in funding for an additional eight nursing positions, officials said. The district also said it is continuing its commitment to support students experiencing homelessness with an allocation of about $2 million for fiscal year 20, which is a $172,000 increase from the current fiscal year. This funding is allocated to schools to provide tailored supports to students. Officials said they are also reviewing and expanding a range of social-emotional supports for our students continues to be an ongoing priority for the district. This includes counseling and health and wellness services, officials said. The teachers union and school officials reached their last deal in August 2017 after 18 months of talks, which were marked by occasional public acrimony.